A relative of one of the RAF Kinloss airmen who died in a Nimrod crash in Afghanistan has paid tribute to a man who "died doing what he loved". Sgt Benjamin Knight's older brother Andy said he had wanted to help the people of Afghanistan. Military and civilian personnel held a service at the base where prayers were said and a minute's silence observed. It later emerged that a soldier killed in a suspected suicide bombing in Kabul on Monday was from a Scottish regiment. The soldier, who has not yet been named, was a member of the Argyll and Sutherland Highlanders, 5th Battalion Royal Regiment of Scotland. 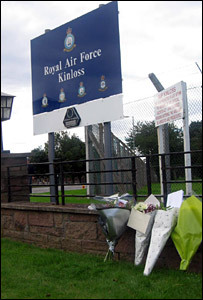 Twelve of the 14 men killed in the Nimrod crash on Saturday were based at RAF Kinloss in Moray. Mr Knight said: "On behalf of my family and Ben's fiancée and everyone who knew him I just want to say a few words about my little brother. "Sgt Ben Knight - or Tapper as he was known to his friends - was a loving son, brother, fiancée, uncle, nephew, cousin and friend. "Everything Ben did, he did with dignity and with bravery and with an energy for life that touched everyone that he met. And he represented vitality and strength and freedom. "He loved flying and he died doing what he loved and what he believed in to ensure that the people of Afghanistan can enjoy the same freedom that he did. "Our thoughts and prayers are with the other families and friends of Ben's fellow crew members. "As a family we want to extend our heartfelt thanks to the members of staff at the RAF who've helped us through this and supported us through this difficult time." RAF Kinloss station commander Group Captain Chris Birks said all non-essential flights, not including search and rescue, had been grounded on Monday for a day of mourning as a result of the Nimrod loss. The small Moray community is beginning the healing process, with counselling being offered to both young and old. Support will be offered at six local schools where families have been affected. Alistair Farquhar, head of educational resource services at Moray Council, said there were several pupils aged between six and their early teens who had lost their fathers in the tragedy. He said: "Many of them have attended school today as their families are endeavouring to keep some sort of normality." He said of the crash: "It appears this has been a technical failure of some sort which, perhaps, is slightly easier to deal with than had it been an act of war or an act of terrorism. "Our condolences go to the families at this sad time and we will support them in any way we can." The Nimrod MR2 came down on Saturday, killing 12 air personnel from 120 Squadron based at RAF Kinloss, a Royal Marine and a soldier. An inquiry is under way, with a technical fault so far being blamed. The 12 RAF personnel killed were: Flight Lt Steven Johnson, Flt Lt Leigh Anthony Mitchelmore, Flt Lt Gareth Rodney Nicholas, Flt Lt Allan James Squires, Flt Lt Steven Swarbrick, Flt Sgt Gary Wayne Andrews, Flt Sgt Stephen Beattie, Flt Sgt Gerard Martin Bell and Flt Sgt Adrian Davies. Also named were Sergeant Knight, whose brother paid tribute, Sgt John Joseph Langton and Sgt Gary Paul Quilliam. The soldier who died was Lance Corporal Oliver Simon Dicketts from the Parachute Regiment and the Royal Marine was named as Joseph David Windall. Scotland's First Minister Jack McConnell said: "It will be a very difficult time, not only for the family of those involved but for the entire community. "I know that they will support each other through this tragic period. "I would like to pay tribute to the bravery of those killed." Mr McConnell added he had spoken to both the RAF base and Moray Council to "pass on both our sympathies and offer the condolences of everyone at the Scottish Executive and indeed throughout Scotland".